Hood River WaterPlay is the Gorge’s premier water sports centre in the beautiful Columbia River Gorge right in the heart of the National Scenic Area in the small and friendly community of Hood River, Oregon. We are the only facility in The Gorge with our own private beach and are an Official U.S. Sailing School. Located just east of the Hood River Inn/Best Western hotel, we offer Windsurfing, SUP (Stand Up Paddleboarding) Jet Ski / Wave runner rentals, Catamaran small boat sailing and kayak rentals for the whole family. If you want to learn how to Windsurf you’ve come to the right school! All it takes is the desire to learn. We provide Beginner, Intermediate, and Advanced lessons. And there’s much more, but we’re really pretty modest. Once you’ve mastered the basics, it’s time to practice. Or if you’re from out of town and just need some gear, give us a call. We’ll help you get matched up with gear that fits your skill level and the current weather conditions. And we’ll get you set up with wetsuit, harness, and booties. Just get yourself to Hood River, give us a call, and we’ll take care of the rest. Get WaterPlay wet anyway with our SUP’s (Stand Up Paddleboards) available at our Event Site location. We’re open 7 days per week to serve you throughout the summer. Simply call us at (541) 386-WIND (9463) and we’ll set you up for maximum fun! Stand Up Paddleboarding is the new, hot sport that’s taking the watersports industry by storm. There’s no better way to enjoy the Columbia River and get in great shape. It’s so easy, anyone can do it. Why SUP is the hot new sport! Great for light wind days. Relaxing enjoyment of the mighty Columbia River. Free 1/2 rental after lesson. The Columbia River is an exciting place to sail. If you’re in the mood for some real fun, come rent one of our Hobie Cats. They’re easy to sail, fast, and roomy. Sailing on the Columbia River is perfect on those medium to light wind days. 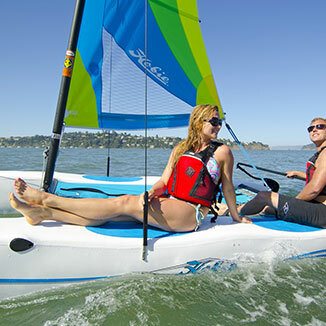 Hobie Cats are easy to sail and user friendly. 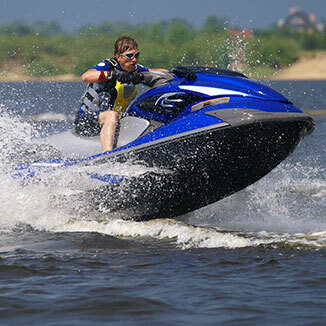 For real excitement, rent our Yamaha VX 110 4-stroke Waverunners. These are the only Jet Skis available for rent in the Columbia Gorge. These Waverunners are powerful and safe. Basic safety orientation is provided. Considering adding this to your vacation adventure. Windsurf one day, SUP another, kayak the next day, and then really explore the river by renting Jet Skis. You can really cover some ground fast. What to do on those occasional non-windy days? 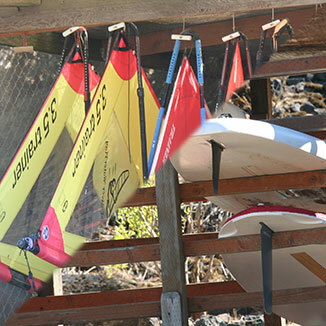 We have a fleet of new, entry level Ocean Kayaks for rental use anytime you are looking for a no-wind alternative. Cruise along the Columbia River in ultra-stable sit-on-top kayaks. 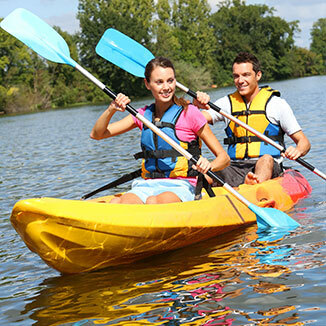 Our kayaks have a capacity of two people, and we have plenty of kayaks, so you’re guaranteed to have fun for the whole family. The Columbia River has countless nooks and crannies to explore. 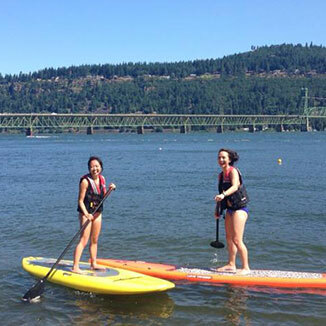 Hood River WaterPlay offers an introduction to recreational kayaking when the waters are flat. (No, or very little wind) Call us to register, class size is limited due to the small student to instructor ratio. 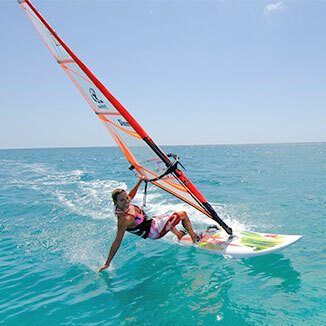 Windsurfing Lessons, Windsurfing Rentals, SUP, Kayaking, Catamaran Sailing, and Jet Ski Rentals, Stand Up Paddleboarding--Your Complete Watersport Center.